Karen (PDEd.BAHons.Mus.Dip.LCM)joined music Generation Wicklow in August 2013. She is a qualified secondary school teacher who graduated from Trinity College Dublin in 2012. Her expertise lies in Irish Traditional Music and Music Education. She plays many different instruments including Button Accordion, Piano (both classical and traditional), Tin whistle and Bodhrán. Karen is a very established performer and has travelled to many different countries playing and promoting Irish Traditional Music as a solo musician and as part of a group. One of Karen’s recent successes was winning a gold medal at the All-Ireland Fleadh Ceoil in Derry this year with her local Comhaltas group Gorey/Ballygarrett CCE. 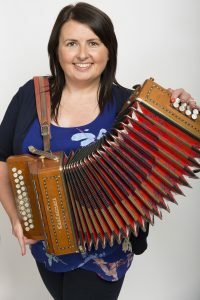 Karen has taught in the County Wexford School of Music teaching traditional group ensembles. She has also worked in many secondary and primary schools around Wexford and Wicklow teaching Music from Junior Infants up to Leaving Certificate and Post Leaving Certificate level. Karen is delighted to be joining the Wicklow Music Generation team and looks forward to an eventful and enjoyable year ahead!